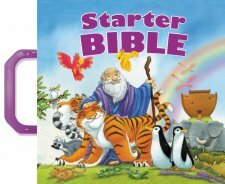 The Starter Bible is a thick, board book with a convenient purple handle so little ones can tote it around easily. The cover is inviting with bright, bold colors and images. The beautiful illustrations fill this book from cover to cover, engaging young readers. There is so much happening on each page that your child won't be able to keep their eyes of the colorful pictures while you read these timeless, biblical stories to them. Beginning with, "God Made The World," to "Jesus Is Alive Again,"this book takes your child through parts of the Old Testament and New Testament alike. Of the twenty stories presented in this book, my favorite imagery is in the account of Jonah. The illustrations are simply beautiful! There are two pages dedicated to each story. If you are looking for a nice, decent sized board book style Bible for a little one, then I highly recommend the Starter Bible!